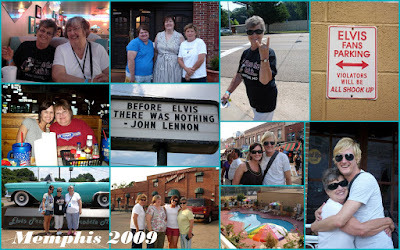 I am going to list the photos as suggested by Vee: starting with the upper left: Mom and Aunt Patsy, me, my HS friend Carrie and Tammi, my mom and her Rock On sign!, a cute sign at our hotel, Ashley and me at Lamberts Restaurant, another cute sign at our hotel, Ashley and Nathan, Ashley, mom and Patsy by one of Elvis' cars, Tammi, Patsy, Ashley and mom outside of Spaghetti Warehouse, the guitar shaped pool at our hotel and mom and Nathan! Happy Birthday to your Mom, Terri! I wish we could get together for lunch at the lake, but we will be like ships passing in the night,this week. We have one appointment after another this week and won't be going to the lake until Thursday or Friday morning. Sure wish we could get together. It would be fun. Hi Terri, happy birthday to your mom. Really glad you all had a wonderful time. Oh I am SO happy you had a wonderful trip! Lord have mercy, Lamberts Cafe...Home of the Throwed Roll, and David Lee Schuster's favorite place on Earth to eat. Beautiful, fun-filled pictures. Happy bdy to your Mom. You know what I think about you gals all heading off to Memphis! A collage that captures all that joy is a very good thing! Happy Birthday to your cool Mom! Hoping your mom had a rockin' good birthday! She's certainly blessed with an awesome family! Loved the mosaic of the trip! I told Ashley that you all need to take Grandma to the Kiss Coffeehouse at Myrtle Beach. I have a ton of "rock on" photos from my vacation. The next time you take a trip like this with the girls, can I come along???? ?